4Videosoft Blu-ray Ripper is a professional Blu-ray ripping software, which can help you convert Blu-ray disc to any popular video and audio formats easily. You also can use it to rip DVD and convert video files and this Blu-ray Ripper has amazingl editing functions, such as modifying video effect, trimming length etc. It newly supports HTC One X, HTC Butterfly, Samsung Galaxy S5, Note 5, Tab 2 7.0, Tab 2 10.1, Nokia Lumia 920 etc. 4Videosoft Blu-ray Ripper, a professional Blu-ray ripping software, which can rip Blu-ray disc kinds of video and audio formarts, such as MP4, MPG, ASF, MKV, FLV, 3GP, MP3, AAC, AC3, MKA, M4A, etc. Besides, you can use it to convert any DVD disc and common video files. And you can rip Blu-ray/DVD/video to various digital players such as iPad, iPad 2, iPhone, iPod, Apple TV, PSP, Creative Zen, Zune, and so on with it. 4Videosoft Blu-ray Ripper can help to adjust video Brightness, Contrast, Saturation so as to get the pefect video effect. Besides, it can used to add text or picture watermark for your output video and adjust the exact start time and end time you want. It can help you to add several Blu-eay movie chapters at the same time into one file. Besides, if you want to change the video play screen and adjust video aspect ratio, 4Videosoft Blu-ray Ripper also can help you to solve it. 4Videosoft Blu-ray Ripper provides you with the subtitle and audio track for your output video. 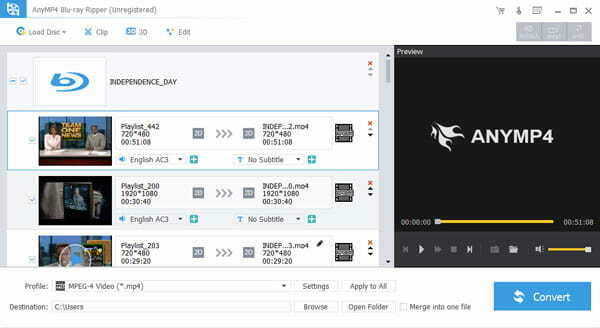 It also can help you to choose output video without subtitle. Besides, It can make you to select what you want to output the video and audio format for your player . You can preview the original video and output video. And you can click&quot;Snapshot&quot; to get pictures you want. The friendly interface provides you with much easier operation and unexpected user experience.